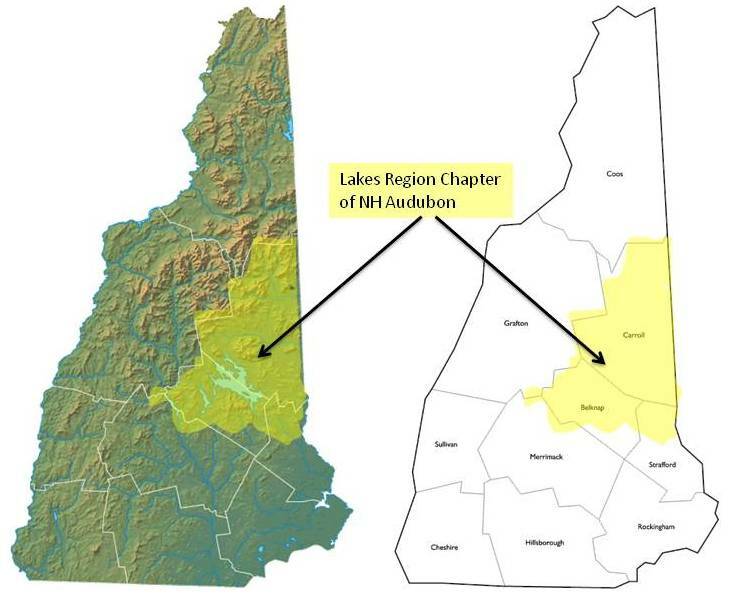 Welcome to the Lakes Region Chapter of New Hampshire Audubon. We are a group of committed volunteers who help bring the Audubon mission into Carroll County, Belknap County and beyond. All of our activities are open to members and nonmembers alike. We offer free monthly programs held at The Loon Center in Moultonborough, NH. In a comfortable, informal setting local experts share stories and information about birds, animals, weather, the environment, and all things nature. For more information on our programs held on the third Thursday evening of the month, follow this blog. The upcoming program will be at the top of the page. We also offer small-group field trips in the area during spring and fall migration. For more information about upcoming birding field trips, go to Field Trips. We also participate in two special projects every year: The spring Bird/Bloomathon and the Christmas Bird Count. To read more about these projects go to Birdathon/Bloomathon and Christmas Bird Count. In addition to beautiful lakes of NH, the region includes mountains and portions of the White Mountain National Forest.